When Sammy Guinta and his brother were in their teens, their dad decided to open a hot dog trailer on Irving Park Rd in Chicago. 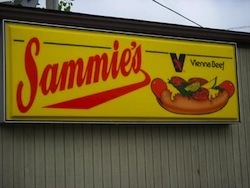 Less than a decade later Sammy raised the stakes and opened a stand in Grayslake, Illinois. Today, with partners David Keith, Tom Sheehan, and Sammy’s son Dominic, they have expanded Sammie’s mystique to the neighboring communities of Round Lake and Lake Villa. The sign from atop the original trailer on Irving Park is proudly displayed on the counter.. It is a constant reminder of the quality and customer service that got them where they are today.